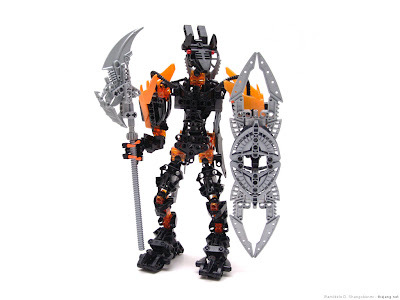 With Teridax's shocking rise to complete power over the Matoran Universe, Vengeance, the Dark Hunter with a life mission to fell the treacherous Makuta, grew more hateful, wicked, and erratic with each passing day. As the realization grew clearer that his last chances to fulfill his goal may have passed, wreckless fury brewed within him and began to dominate his existance. He grew increasingly inpatient and disobedient, drawing the ire of The Shadowed One himself, who ordered Vengeance to take time off from his duties to... contemplate... his allegiances. Vengeance reluctantly obliged, retreating to a solitary shoreline cove at the northwest corner of the island to gather his thoughts. There he sat, silently, staring aimlessly at a point on the ground just a few paces in front of him. For four days and nights he sat, pondering future possibilities, running scenarios through his head. Just before dawn on the fifth day, he stood. He realized that the only possibility of gaining the upper hand on Teridax would be if the Dark Hunters all united in singular pursuit of this goal, something that would never happen without a leader who was completely dedicated to the task. Eight nights later, The Shadowed One was walking back to his throne room after a day of surveying the land, when suddenly, Vengeance sprung upon him from a dark perch above. Vengeance charged his rhotuka, but before he could fire it, The Shadowed One destroyed it with a blast from his Staff of Protodermis. The two separated and The Shadowed One fired off several more blasts, but Vengeance easily deflected the attacks with his incredible shield. The Shadowed One reared back and charged with all of his might, his weapon pointed straight forward. They met with a thunderous clash and the very tip of the Staff of Protodermis just barely penetrated Vengeance's shield. The Shadowed One fired a blast, sending a small stream of Protodermis directly into Vengeance, but with much of it reflecting back from the shield. The substance instantly hardened on both Dark Hunters, and The Shadowed One could no longer control the staff. Protodermis continued to stream out and immediately harden, encasing the two in an ever-growing, solid mass, until all of the energy of the staff had been drained. For several minutes there was complete and utter silence, until a faint reddish-orange glow began to emanate from the folds & creases of the protodermis mass. Vengeance was using his telepathic powers to activate The Shadowed One's powerful eye beam attack. Incredible heat and pressure built up in the core until the protodermis completely liquified from the inside. The outer shell glowed intensely and the chamber began to shake. Fractures appeared on the surface of the mass, and then, in an instant, it burst in all directions, sending a concussion wave rocketing down all corridors of the lair. Splatters of molten protodermis re-hardened on the walls and ceiling of the chamber, but where two encrusted Dark Hunters once stood, now there was only one. The intense concentration of power from The Shadowed One's eye beams not only liquified the protodermis, but energized it. Trapped inside, he and Vengenace combined into a single being, now known as Shadowed Vengeance. He bears Vengeance's shield and telepathic powers, has The Shadowed One's eye beam strike and Staff of Protodermis, and small wings that aid brief gliding flights. Strangest of all, he contains the combined, conflicting consciousnesses of both warriors. Time will tell how this shocking development will affect the future of the Dark Hunters, and whether what remains of Vengeance will manage yet to take down the powerful Makuta Teridax. 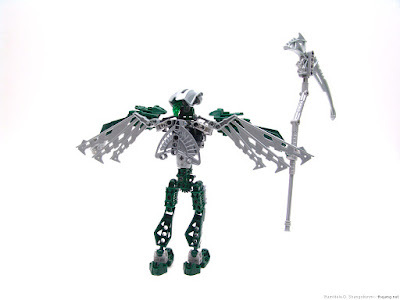 This is my personal interpretation of Toa Nidhiki. Click it for a bigger view. 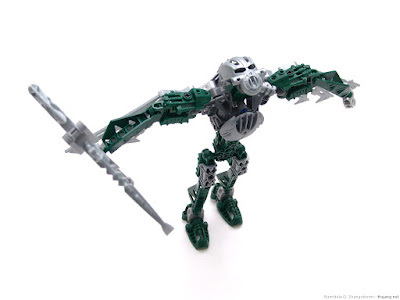 If you haven't long since read about it, Nidhiki, most commonly known as a Dark Hunter, was originally a Toa of Air before being morphed into his four-legged freak state by Roodaka. 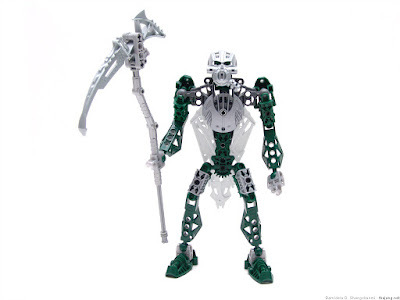 Breaking from the way I normally work, I searched the Web for examples before starting on this guy because I knew wih the popularity of Toa MOCs, there were sure to be some previous attempts. Sure enough, there are some out there, but I didn't look them up for inspiration -- I looked to see what was already done to make sure mine wouldn't look like any of them! I used the correct canon mask (per Farshtey himself) and included the breast plate that was preserved in the popular mutated form. 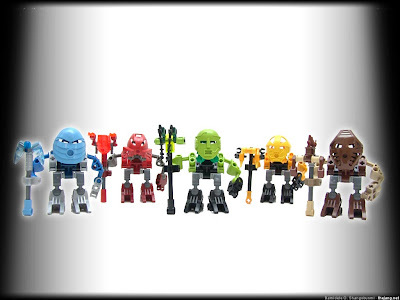 Most commenters on previous MOCs have insisted that Toa Nidhiki must be built with a typical Toa Metru body, following the style of the Iruini set. Well, I briefly looked at that possibility, and I hated it. Looked very weak and spindly. 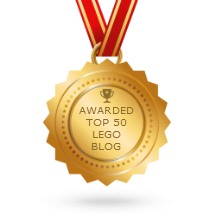 Sorry, I will not rebuild this with a Toa Metru body! It's much better like this, trust me. I used this Nidhiki picture as my main inspiration during the build to get the appropriate mix of colors. Since he was a Toa of Air, I wanted to give him wings, and the Mistika pieces looked just right. It was extremely tricky and took hours to get them mounted, because I wanted them to fold into a diamond neatly behind his body. I ended up setting them up on a beam that would slide straight down about 3/4ths of an inch to extend the wings, and move back up to keep the front profile heroic in nature. When the wings had a fixed mount low enough to fit under the arms properly, they looked all wrong when folded up. Finally, there's the whole deal with the Air Scythe. I'm sure there are plenty of concepts about how this should look, but this is my simple take on it, using a piece from the TRU titan Toa Mata Nui set, mounted at an angle and with a curvy handle. 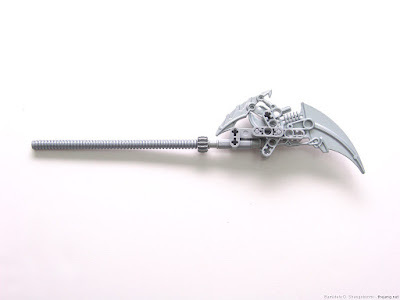 In putting this together I just looked at pictures of real scythes and tried to find what would approximate that look without inspiring images of the Grim Reaper. So there you go, Toa Nidhiki! If you haven't yet seen the story of Valtys, you can check it out here. 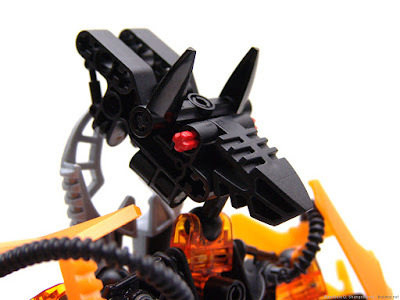 What was my inspiration for this MOC? Basically out of nowhere I wanted to do another being that would tie into the Bara Magna storyline, and the first things that came to mind were the colors red and yellow. This is how most of my builds begin -- a random spark of inspiration, which leads me to start pulling parts out of bins and spreading them out on the floor. 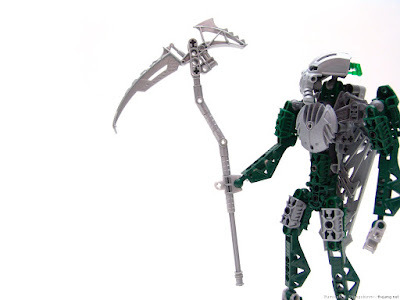 I felt like this had too much Mata Nui in it, though, plus the Brutaka mask, even with the Bara-esque translucent shadow-Matoran head underneath, didn't really feel right to me. I think mostly it was just too large, making the whole figure seem smaller. When I substituted Mallum's head, it was perfect, making this guy look really tall and buff, and I rolled with it from there. The horizontal part of the shield actually can be pulled out slightly and rotated parallel to the vertical part for carrying. I don't have a good picture of the left hand but I set it up so it looks like he's holding a real shield handle with his clenched fist, rather than integrating a ball socket into the structure of the shield itself. The axe uses two Axxon axe halves back to back, forming parallel blade edges. There's a hand & wrist guard only on the right side for a little extra protection -- he didn't need one on his shield side because, well, there's a shield there! Valtys has a little bit of twist available at the waist thanks to one of those sturdy two-way rotating joints from the original Makuta Teridax set, buried deep in his lower core. Yes, I use a Zamor launcher as a Thornax launcher. No, it doesn't really shoot, but visually I think it fits together nicely, especially for a shoulder-mount where proper Thornax launcher jaws would be pretty long and unwieldy. Well, that's Valtys for ya! Hope you like 'em! How quickly we forget. Ackar may have been the first Glatorian in history, but he was never one of the greatest, nor the most influential. The Element Lords, during their reign, paid much attention to the actions and accomplishments of their lieutenants, the highest among the warrior class. The strongest, hardest-working, most righteous were promoted in a secret ceremony attended by a single Great Being, transforming them into titans. Within the jurisdiction of the Element Lord of Fire, Valtys was the first and only of these titans. Valtys was strong of mind, body, and will, not one to be crossed. At the same time, he was unshakably pious and just, always looking out for the best interests of his people before all other things. When the Core War broke out, Valtys initially wanted no part in it other than to protect the Agori of his land from a secondary invasion by the overzealous forces of other tribes. However, as the fighting intensified and broadened across the entire planet, it was Valtys who formulated the plan to assault the northern region and claim the energized protodermis, and it was he who led the successful charge. Why such a dramatic change of desires? Why from shunning the war would he dive directly into it? His plan was to secure the energized protodermis, extract it, and deliver it directly to the Great Beings to transport if off the planet. With the object of the war removed from play, the war would surely end. Well, end, the war did, didn't it?! Not the way Ackar had planned, obviously. Rapid extraction of energized protodermis enhanced the pressure differentials in the planet's core, ultimate leading to the Shattering. Valtys was thought by some to have been destroyed by that horrific event, but this is not so. He survived, battered and ashamed, swearing to dedicate the remainder of his years to the protection of the remaining Fire Agori, and to never forgive himself for his horrific mistake. He died many, many years later, standing his ground against a marauding horde of Bone Hunters, allowing a band of Agori and Glatorian, Ackar among them, to safely escape. Some Agori are said to have seen Valtys's spirit in the form of a nearly transparent silhouette roaming the desert in the last moments of light after the sun sets. 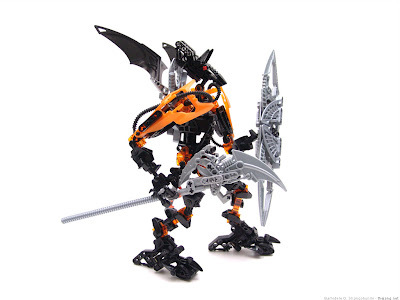 Based on recent and fossilized remains I provided, Milethi has assured me that with very little margin of error, this diminutive creature, barely larger than a Bohrok-Va, is the ancestral Vorox as it would have appeared between 50,000 and 80,000 of your "years" before the Shattering. Most troubling this is, indeed, as it flies in the face of history as we know it. The Vorox are said to have once been proud, upright-walking, talking, very intelligent beings who received particular attention from the Great Beings themselves, only to later devolve into the beasts we know of today as a result of the cataclysm. What we see here looks like a perverse larval form of a Zesk! What could possibly be the explanation? I must contact Milethi again. I have a new assignment for her!